There is a difference between music that creates visualizations and music that speaks directly to the heart, without the mind engaging. This difference cannot be defined by genres and a distinction like that could be misleading, since music is experienced in different forms. What appears as a mystery to me is that art can be highly subjective and at the same time be loved by a huge number of individuals. There is universal language, something that is actualized though music, but it has its beginnings in a place that is common in us all. Such is the approach of the mystic and as such “Hive” appears to speak to me. 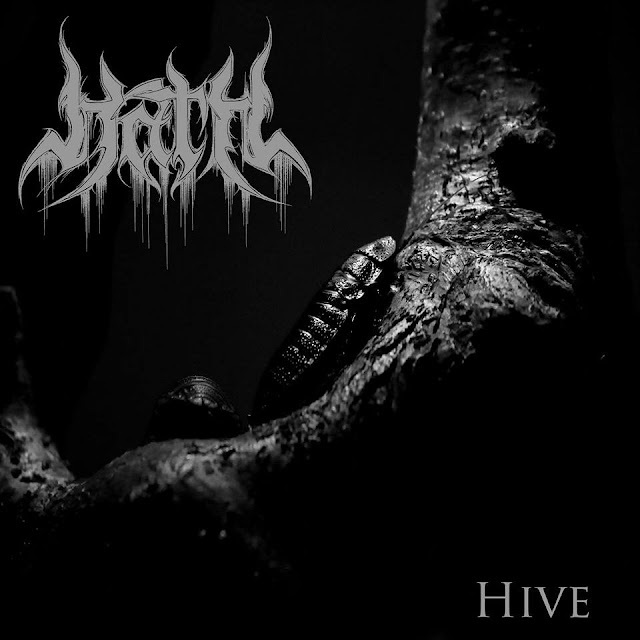 “Hive” is the debut EP from Hath and it has, in every song, a sense of movement. Like a hammock that swings between undefined points. Especially the bass gives away the sense of swelling, like the surface of the sea does when it forms waves. They appear and they fall back in endless cycles. Between those movements the lead guitars speak in simple motifs, giving away the sense of diversity. They are decorating the song, dressing it in pretty melodies that transform into solos. Yes, solos. It feels like solos aren’t cool any more, but they can add so much emotion and depth to the songs. The voice is growling and talks and at times feels complacent with what is being expressed, while other times invokes something greater. “Hive” is not aggressive but it is not introverted either. It moves from being angry to esoteric and this is what makes it feel so rich and interesting. The songs have a progressive feel to them, where the composition is more complex than usual, with layers that develop and riffs changing form, pace and rhythm. Listen to “Commandment” for example; the EP’s shortest song and you’ll listen to the diversity. Hath have released a very good and promising debut EP. I am certain that an equally good or even better release from them will be coming in the future. I do not know if they are in the process of creating a new album or searching for a label or both, but what I do know is that they deserve our attention. Listen to “Hive”.